The MOBA feels like it was made for the portable console. I've been playing multiplayer online battle arena games -- better known as MOBAs -- for the best part of two decades. First it was Dota, back when the game was still a custom Warcraft III map. Steam tells me I've sunk over 2000 hours into Valve's Dota 2, and I must've spent at least another few hundred hours dipping into both League of Legends and Heroes of the Storm. MOBAs are a genre I could never see working on consoles -- controllers just don't have enough buttons, nor do thumbsticks have the precision of a mouse. And yet I just spent a significant slice of my weekend completely glued to Arena of Valor, a port of a mobile MOBA that was released on the Nintendo Switch last week. I tend to show similar symptoms of PC snobbery from time to time. I'm still skeptical about console shooters, for instance, but I'd be lying if I said I felt restricted playing Halo on a pad. I'm also a big fan of PUGB Mobile, the battle royale title that completely flipped my preconceptions of mobile shooters. Turns out when you have a blank slate that is a touchscreen, a few thoughtful UI choices can turn it into a versatile controller. And now I've been proven wrong about Arena of Valor, one of the most if not the most popular game in the world, with over 200 millions players. 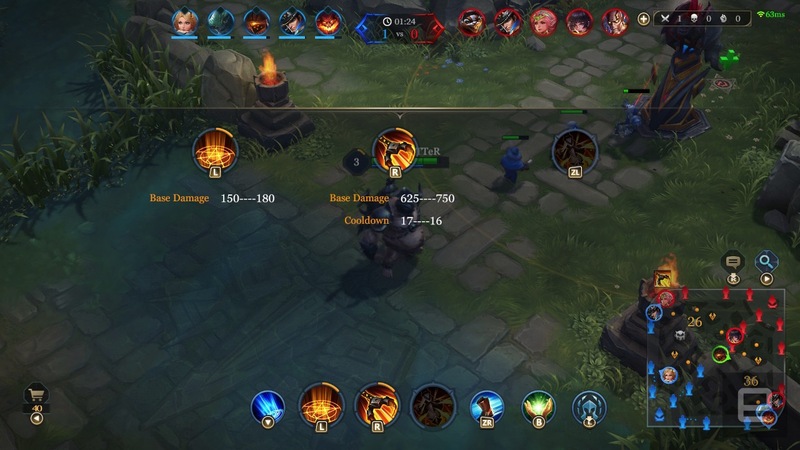 MOBAs are complex games by design, and as such, required complicated controls. 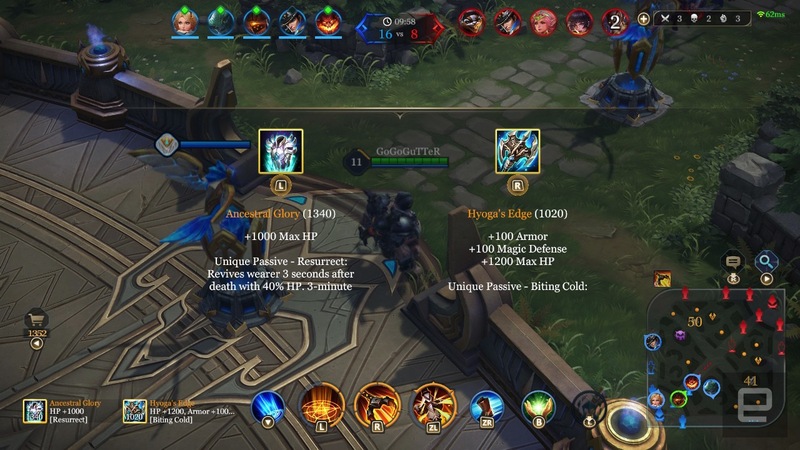 Granted, I've never played the mobile version Arena of Valor -- or Honor of Kings, as it's called in China -- but the control scheme on the Switch feels more than adequate. The left stick controls your character; the right, the direction of targeted abilities. 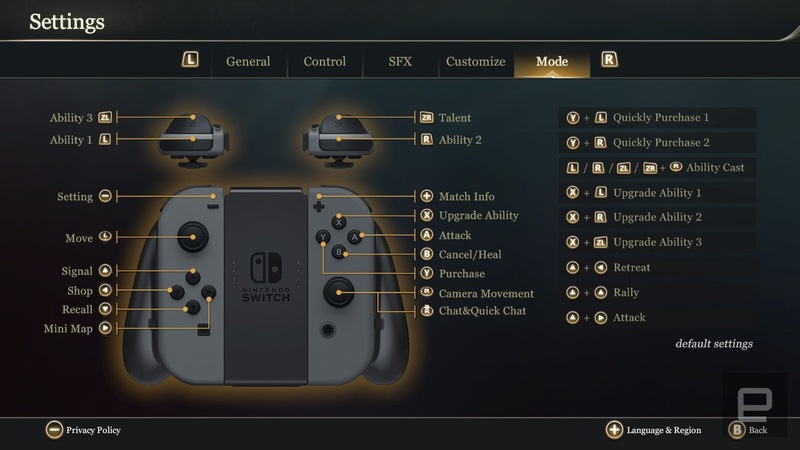 There are plenty of buttons for all your spells and whatnot, and prewritten messages, the item shop and scoreboard are tucked away in menus. Thankfully, these are overlays so you can continue to move your hero around while doing other things. Even the minimap is handily located on the touchscreen for looking at different parts of the field with a quick flick of the thumb. The controls are intuitive enough that I was dialed in within a few minutes, and there are ways to simplify certain elements before you even jump into a game. 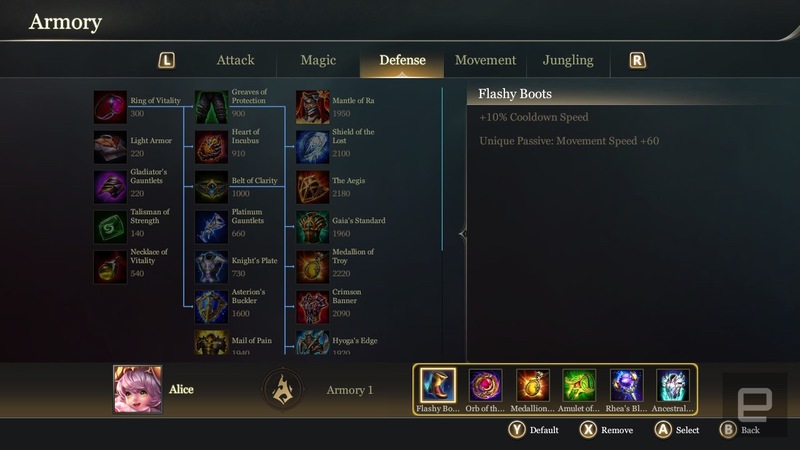 You can prepare item builds for specific heroes and the game will prompt you to quick-buy gear using simple button combinations whenever you have the money. Or you just set it to automatically snag items and level up abilities using your idle gold and experience, if you happen to be neglecting such things. Naturally, full manual is an option if you really know what you're doing. I'm still a novice, but thanks to tight controls, the game's already feeling like my next unhealthy timedump. It helps I'm intimately familiar with the MOBA basics. When to take fights or avoid them, where the windows are to take strategic objectives, and when to sit back, farm gold and collect powerups as I work towards an important item. I understand the roles: Some heroes are glass cannons, others are build to soak damage, and so on. That's another thing about Arena of Valor. 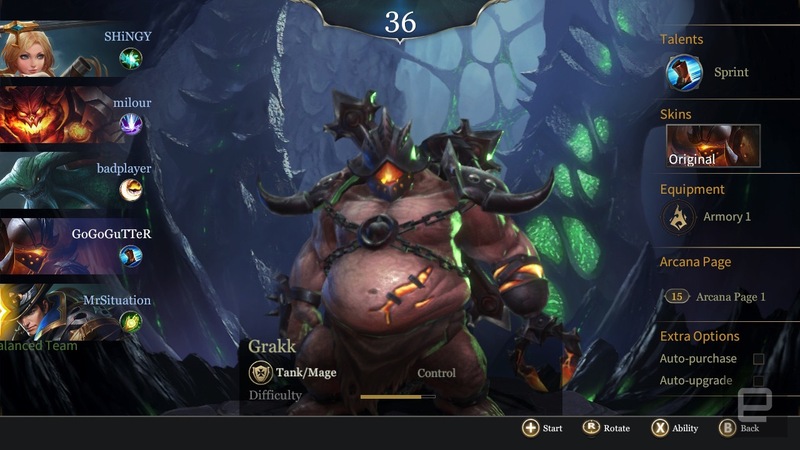 It's a full-fat MOBA. Sure, it's more on the arcadey side than other staples of the genre, but all the important pieces are there. I like the fact a real back-and-forth battle in the late game still inevitably concludes around the 20-minute mark, which would be a quick finish in Dota. There's also nuance to the simplicity. Attacking mindless creeps is a case of mashing the A button, but you still need to intelligently switch target and time the killing blow to get the most gold out of the situation. Positioning, awareness and decision-making are as important as they are in any other MOBA. 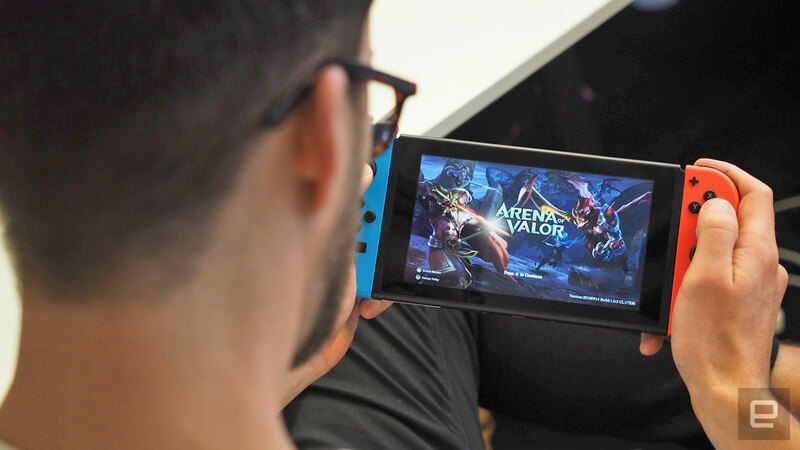 The Switch version of Arena of Valor is notably different to the mobile smash hit, though (at least in its current state). A separate team is working on the console port, going as far as tweaking game balance specifically for the platform. There are pros and cons to this redevelopment process. On the one hand, graphics have been improved for the Switch, you get a wider field of view with the bigger screen, and servers are global rather than region-specific. On the other, there are several features missing on the Switch. Voice chat hasn't been implemented yet -- let's hope it's built-in à la Fortnite instead of awkwardly implemented via Nintendo's mobile app -- and you can't see popular item builds from good players that might help you improve. You can pick from almost twice as many heroes on the mobile version, including characters from the DC universe like Batman and Superman. The Switch build is lacking many alternate skins and uses an older item set that doesn't include gear with special abilities. Nothing that can't be added in the future with more button combinations, though. The Switch version is obviously still a work in progress. The hero roster needs bulking out and I catch missing loading art and glitching textures on occasion. More often than not, the match has started before you even load in, too, meaning you've wasted important early seconds idling in base. The game doesn't seem to be accounting for slight variations in load times on different consoles right now, so as soon as the first person joins the match it begins. The game is free-to-play, and geared heavily towards micro-rewards. 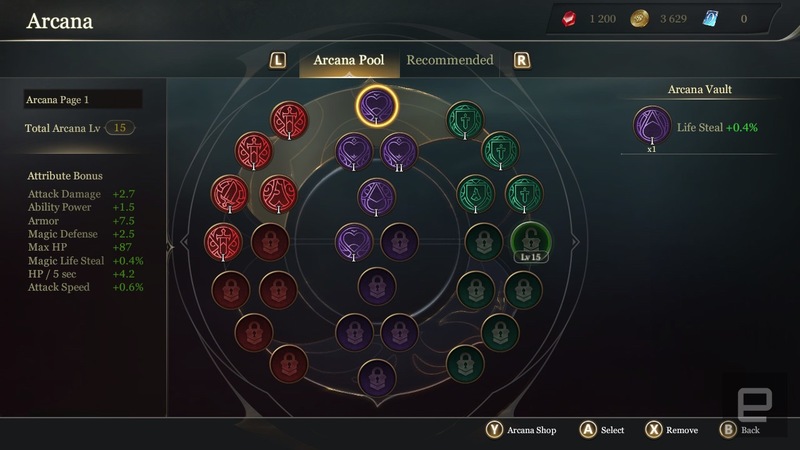 For instance, to play with heroes outside the open rotation you must unlock them with in-game currency, League of Legends style. There are several forms of currency, only one of which you buy with real money. This is somewhat problematic as you can only buy the game's equivalent of loot boxes by spending real money or via consecutive login rewards, unlike the mobile version where you can convert gems you earn by playing into the necessary vouchers. Currently, you can only unlock better Arcana through these loot boxes. Arcana are attributes you assign to your hero before entering a game, and they grant you minor buffs like slightly improved health regeneration. They're only a minor part of the game, allowing you to tweak your heroes stats slightly for specific playstyles and item builds. The fact that the best ones are reserved for paying customers on the Switch, though, means there is an unavoidable pay-to-win criticism to be made. Still, Arena of Valor is an extremely enjoyable, competitive MOBA that feels like it was made for the Switch. It offers such a fine balance between pace and complexity, I can see why it's widely recognized as gaming crack. In China, Tencent was all but forced into introducing time limits for kids: One hour of playtime a day for under 12s, and two hours for anyone aged 12 to 18. Earlier this year, Tencent's CEO also proposed the idea of a feature whereby kids that did their homework or chores could be rewarded with game time. Luckily, I'm in my 30s, live in the UK and can be as irresponsible with my time as I wish. Those dishes can wait until tomorrow.